It's been ages since I've posted anything here. I'm a very bad blogger, it seems. Life has just been SO busy! I bought an older home and have been renovating it. I've discovered I love taking down walls but hate plaster dust. As well, I've learned that one renovation leads to another and another and another! Almost 8 months later, the project is finally wrapping up. Whew! I've also been packing and purging in preparation for moving. I'm pretty much a non-consumer, but I still have way too much stuff. The local thrift shops will be getting quite a few donations. My shoulder has been slowly improving though any excessive use of it will cause inflammation. I find myself having to move with greater care or taking longer than usual to do simple projects. Ah, the joys of getting older! Recently, I've lost several relatives and friends to old age and/or cancer. With each passing, there has been sorrow but I realize I've also learned something from each individual. For example, my aunt was such a gracious lady and I can only hope to emulate her. My friend's mother was always so upbeat and believed in never sweating the small stuff. I'm trying to make that my personal mantra. As well as human losses, a stray cat that had been around my house for over a year had to be put down this week. That was hard as I had envisioned eventually adding him to my inside collection. He'd been someone's pet and they abandoned him to live and die on his own. He'd never been neutered or vaccinated so a combination of fighting for territory and disease eventually did him in. This has firmed my resolve to support my local shelter and push for free or reduced-rate spay/neuter clinics to help control the cat population. So far, 2015 has been rough. I find myself viewing life as being much shorter than ever before. I've told myself to stop putting things off and make more time for 'living'. We'll have to see how that goes! Through all of this, I've been plugging away at the new book. It's due out May 4th, 2015 and is called For the Good of All or GOA as Jan, my editor, has dubbed it. It will focus on Stone, a character that appeared near the end of Road to Redemption. I'm about to send Jan the first half to start editing while I continue to tweak the last part. As I stare at the calendar, I start to get nervous that the deadline is creeping up so quickly. For those of you waiting for a new tale, I'm sure time is moving way too slow but for me, all I can say is "Yikes!" The lull after the book. 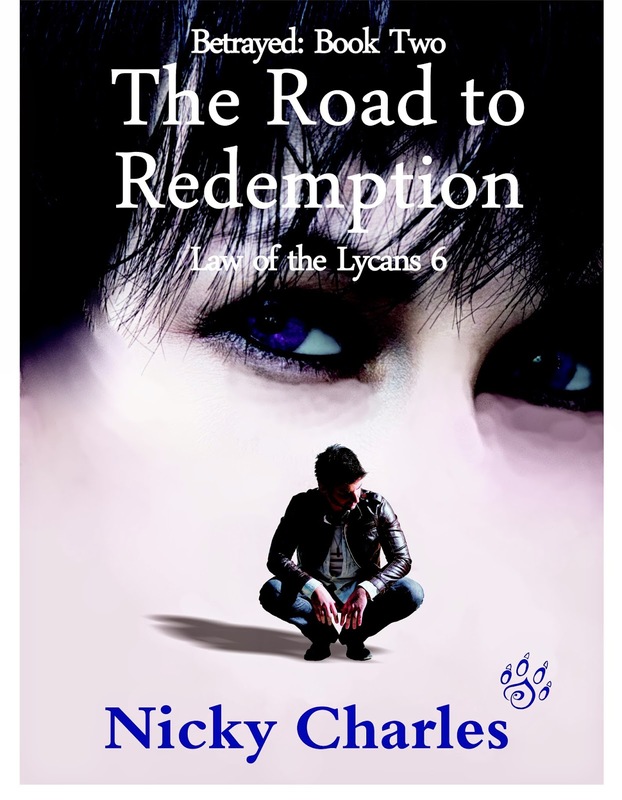 It’s been almost two months since The Road to Redemption was published. The confetti has finally quit floating in the air. The streamers are hanging limply from the ceiling and the balloons have lost their helium. Fan mail is slowing to the usual trickle and I no longer check the book ratings and download numbers each day. Life has returned to normal. An author leads a ‘normal’ life? Yep. We're just normal folk with a slightly unusual job. A job from which I'm trying to take a short vacation. Now that the hubbub of my latest book is over, I’m concentrating on real life. Fun things like cleaning – I can’t believe how much hair my cats have shed—and filing away papers that I barely glanced at and set aside to deal with later. Things like getting the oil changed in my car, tackling the mess in the basement and making a doctor’s appointment for my arm. Things like trying to get my ITIN and figuring out how to declare myself the sole proprietor of a small business for when income tax time rolls around next year. I’m starting some home renovations and I'm helping my elderly parents. I’m also reconnecting with friends I neglected and indulging in some of my other hobbies such as gardening and cooking. Just today I made a summer berry pie using raspberries grown in my backyard. Yum! Reading a book I haven’t written is still on my list of things to do, as is sitting by the water, watching the boats go by and doing absolutely nothing. Ah, wouldn’t that be the life? Long days of leisure, sitting with my feet up and dozing without a thought in my head…. That’s what I always hope for and it never happens. Writing doesn't seem to want to give me that vacation. Re-edits of The Mating and Bonded are waiting for me in my in-box so I can get them out as paperbacks. The characters in my head are continually nudging me wondering when I will allow them to see the light of day. My website needs updating, this blog has been neglected. The story files on my computer should be sorted and backed up. A group of authors wants me to contribute a story to a boxed set. Friends and fans keep asking which book I’m going to write next. They’re eager for another story to read and I’m grateful for their enthusiasm for the series but...it’s too soon. I’ve written about a thousand words of two possible books and still haven’t decide which one I will focus on. They both appeal to me but, quite frankly, my muse is still tired. Working all day and ‘authoring’ at night really wears me down. The old adage of ‘burning the candle at both ends’ holds more than a grain of truth when you are fifty. I still need to recharge my batteries. I need to rest my arm - I've developed tendonitis from too much time at the computer. I need to not be an author for a while longer. And then, I promise, I’ll write you another tale. It's a little less than 2 weeks until the release of Betrayed: Book 2 -The Road to Redemption! I find this in-between time nerve wracking. After months of planning, writing, revising, working on graphics, tweaking, formatting and the plethora of other little steps that go into publishing a novel, its all over. There's a lull. I'm not 'talking' to the characters anymore. I'm not wondering how their relationship will turn out. That's set in stone except for changing a word or two here and there, based on feedback from those who a reading the ARCs. I'm not writing the blurb or fiddling with the cover art. And contemplating what the first reviews will say. I have to stop myself. Jan told me she'd quit if I dared to touch the story again so I reluctantly take my fingers away from the laptop keys and close the file. I try to busy myself with long neglected housework. I begin to format the book for the paperback version on Createspace. I try to relax and open myself up to the next set of characters who are stirring the interest of my muse. And I wait for release day. In what order should you read the Law of the Lycans? There's often some confusion over the order in which to read my books. 3. You can read them by story strand: Bonded, Betrayed: Days of the Rogue, The Mating, The Keeping, The Finding. Check out this graphic and you'll see what I mean. Quite truthfully, I get confused at times as well! I do apologize but it's all the fault of my muse. 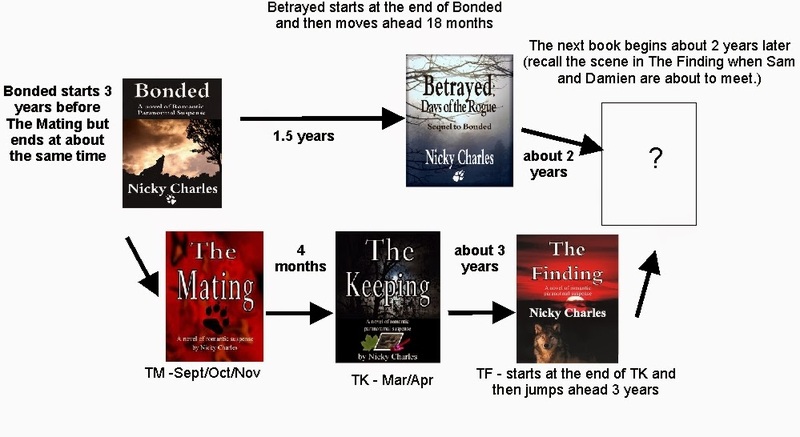 The first Lycan book I wrote was The Mating followed by The Keeping and The Finding. It was so nice and tidy, one book following the other in a linear fashion. Then Damien appeared. He's a rogue, so of course he had to cause trouble. Damien came out of nowhere. I had no intention of creating such a character but there he was, walking into the story line of The Finding. He was obviously a tortured soul with a dark, tragic past and suddenly my imagination was on fire, trying to figure out what had made him this way. I decided to write about his background. That's when all the confusion began. My muse decided that Damien's story started three years prior to The Mating which meant I was travelling backwards in the Lycan timeline - say goodbye to the linear development of the series! I decided I could handle it, though. One book out of order wasn't too many, was it? How naive I was! I'd no sooner started on Damien's story when his friend, Reno began demanding attention. (And when Reno demands attention you have to give it to him!) Damien's story turned into Reno's story and thus Bonded was 'born'. It was a good book, even if I do say so myself, and there was some of Damien's story in there. Surely that should suffice. At the moment, this site is mostly 'under construction' but I do want to share with you some exciting news: Betrayed: Book 2 - The Road to Redemption will be released May 1. You can place your pre-order at iTunes. Other ebook retailers will have pre-orders available in the near future. Nicky Charles. Simple theme. Theme images by caracterdesign. Powered by Blogger.